I have been looking for a uv light and was wondering if the black light bulb will work for detecting the uv dye that is used in ac systems? An employee as a local store said they were uv lights and would detect the material. True or false? These bulbs said they can used to detect material for parties and other things but did not list ac systems. I tried one of the 60 watt incandescents, pretty much it doesn't work. Maybe the fluorescent ones are better, decided not to potentially waste more money on that. UV dye can occasionally be seen just parking the car in the daylight, but if your leak is where the sun won't shine you'd need a UV light. Not sure about black light...Never tried it...hear some say they work, others they don't....But just as important as UV rays are the glasses in daytime leak detection. Check out UV kits and be sure to use the glasses when trying to find a leak in the daylight...Hope this helps. Black light 60 watt incandescent bulbs COULD work if installed in a highly reflective housing that focuses UV light on the work. Unfortunately, most of these polished aluminum or stainless housings for a 60 watt work bulb are way to large (8 inches) to examine anything but what's obvious above the engine bay. UV A/C lights use special high intensity bulbs in a housing that accomodates limited clearance. Used my son's 4-foot flourescent black light (at night) and the engine lit up like a hippie party! A little hard using it on to look from underneath, but from above was pretty easy. Also - puchased a UV-led flashlight on the internet - it's got over 20 leds - thought that would work well, but haven't been happy with it. Seems the best bet is just to get the UV kit offered here! I've poked around the internet and find that there are different wavelengths of UV lights available. Does anyone know the optimal wavelength UV light for the dye we use? I have been using a compact flourescent "blacklight" in my drop light for a couple of years now, and have been happy with the results. If you live in the desert, you can always go looking for scorpions with your light after you fix the leaks. 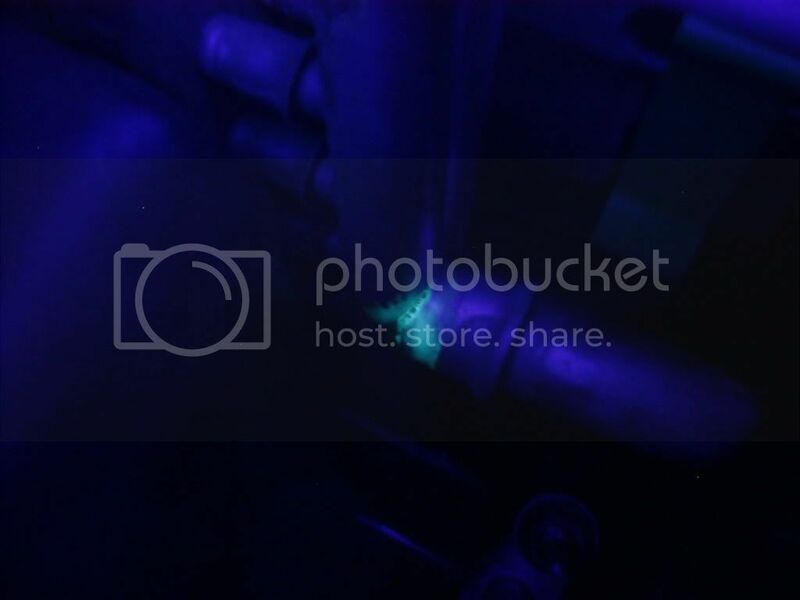 A blacklight bulb in my droplight was useless for uv dye leak detection. I replaced the bulb in my small flourescent light (6-10" long) and it works.